Ford got help from suppliers to reduce CO2 emission 18 percent to 139 grams per kilometer in the new third-generation Ford Focus compared with the previous generation’s 2.0-liter model. The new Focus offers electric power assisted steering, a standard feature that reduces CO2 emissions by approximately 3 percent compared with a traditional hydraulic steering system. ZF Lenksysteme GmbH supplies the steering pump to the system, while ThyssenKrupp AG provides the steering column. TRW Automotive supplies the Focus with its steering wheel base and switches. Freudenberg Sealing Technologies helps cut the Focus’ emissions with its so-called Low-Emission Sealing Solutions (LESS). The German supplier’s modern encoder technology provides the data needed to optimize the injection process and, therefore, the combustion process too. In addition to encoders and radial shaft seals for engines and transmissions. Freudenberg also supplies the compact car’s rubber-steel composite parts, valve stem seals, boots, O-rings, and shock absorber seals. IHS Automotive forecasts that 366,000 units of the Focus will be produced at the Saarlouis plant in 2011 and sees output peaking at 400,000 in 2012. European production will be expanded later this year when Ford’s assembly plant in Vsevolozhsk, near St. Petersburg, Russia, starts building the new Focus. The previous-generation Focus and current Mondeo are made in Russia. 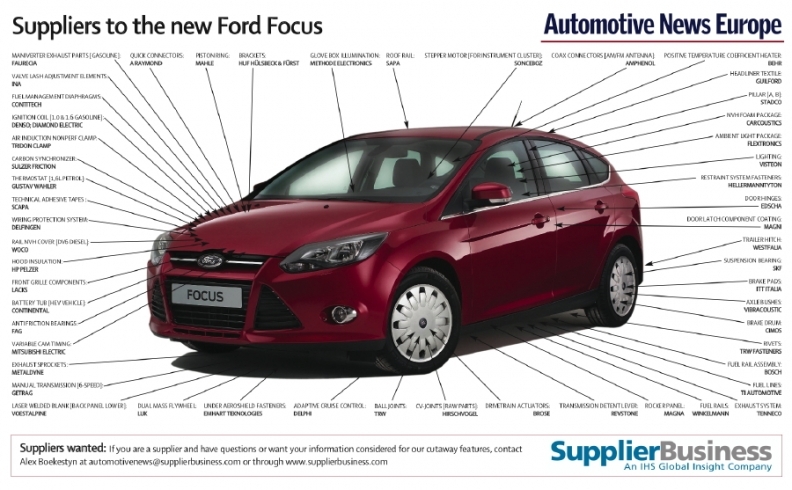 Ford’s factory in Chongqing, China, will start making the Focus in early 2012.